What If your realme phone has slow Internet speeds? Learn why network speed are slow and how to fix them. If you are using a Mobile data network connection. 3. 2/3G network signal: When signal strength is at 0-2 bars, the signal is weak. 4. 4G network signal: If the up and down arrows of "4G" icon do not light on, the signal is weak. 5. Remove your phone case if there is one, for a metal case will block the reception of the signal. First things first, make sure your phone is not out of credit. 2. When locates in the reception will be affected or completely fail. Make sure to use your phone in an open area within operator network coverage. * Mobile data network signal also get affected in crowded places such as schools, shopping malls and auditoriums. * If you're traveling international, make sure that you have opted for roaming plans. Enable the on your phone for smooth functioning. 1. Go to [Settings] > [Dual SIM and mobile network] or [Dual SIM & Cellular], check if your SIM card is enabled. 2. 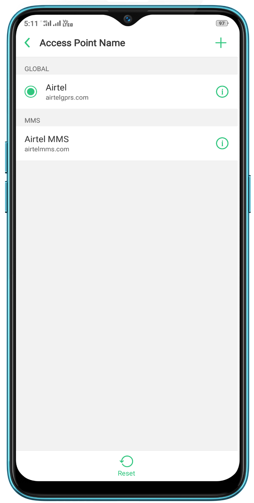 To select particular network type covered locally, go to [Settings] > [Dual SIM and mobile network] or [Dual SIM & Cellular], adjust [Preferred network type] to [4G/3G/2G (Auto)]. 3. If there is a VPN connection, disconnect it, then go to [Settings] > [Dual SIM and mobile network] or go to [Dual SIM & Cellular] > [SIM card info] > [Access point name], reset APN to default settings. With some models, you can update APN in [Dual SIM & Cellular Data] > [SIM Card Info] > [Access point name]. Take out the SIM card, check if it isn't damaged, clean the chip and put the card back in, or try another SIM card on your phone to see if you fixed the issue. * Your phone will fail to get networks and communication signals if the SIM card is seriously abradant, degaussing or damaged, you need to get a new SIM card from the operator. 1. Check with your operator if there are network failures and limits in your area. 2. Check with your operator if there is Mobile data speed limits (e.g. JIO) or other SIM card functions that cause slow network speeds. 3. You cannot use 2G network in some countries or regions (e.g. Singapore, Taiwan and Australia) for the service has been ceased. Adjust the Preferred network type to [4G/3G/2G (Auto)]. Multiple Apps running in the background will consume network speed and phone memory, so close the APPs when not in use timely. * For example, downloading files in the background while watching videos online might affect the buffering speed of the videos. If you are worried that you cannot receive some applications' messages after they are cleaned, you can lock them up. Click Menu and slide down the APP. When you see a lock on the left corner, the APP is successfully locked. Virus or malicious plug-ins in your phone will also result in slow network speeds. Regularly do security scanning is recommended. If you are using a Wi-Fi network connection. 1. Check the Wi-Fi signal on the status bar. Make sure that you're within router's range and can receive the signal of sufficient strength. 2. When connecting to a public Wi-Fi network, network speed might be slow for there are too many users. Try to connect to other Wi-Fi networks and see if you fixed the problem. 3. Try other Wi-Fi networks on your phone to exclude phone problems. 4. Clean up the caches and junk files on your phone, and do security scanning. 5. If you are a Wi-Fi network administrator, restart the router. 6. Check with your operator if there are network failures and limits in your area.